Seville online ES Plaza de España, Seville - Andalusia, Spain. Representative of much of the regional architecture, this magnificent construcion is highlighted with polychromatic ceramic tiles. The semicircular plaza has a diametre of 200 metres and is flanked by two spectacular towers and a bordering lake that are especially worth seeing. It was built for of the Ibero-american Exhibition of 1929, held in Seville. Its creator was Aníbal González. He mixed a style inspired by the Renaissance with typical elements from the city: exposed brick, ceramics and wrought iron (worked by Domingo Prida). Its floor plan is semicircular. It is dominated by 2 towers, one on each side of the enclosed area, which frame the central building where the main rooms are. Between the two towers runs a network of galleries with an arcade of semicircular arches leading to exits in different parts of the square, where a fountain stands. The large brick building flanked at each end by a high tower has fifty eight benches in recesses decorated with tiles, depicting historic episodes for each province of Spain. 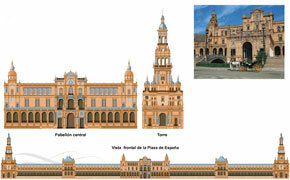 Plaza de España has been used for some of the scenes of episode II of George Lucas' STAR WARS saga Attack of the clones. Anakin Skywalker (Hayden Christensen) and Padmé Amidala (Natalie Portman) have a walk, in the company of R2-D2 (digitally added). Hundreds of Spanish fans gathered at the location. To catch a glimpse of their heroes or get an autograph from George Lucas. 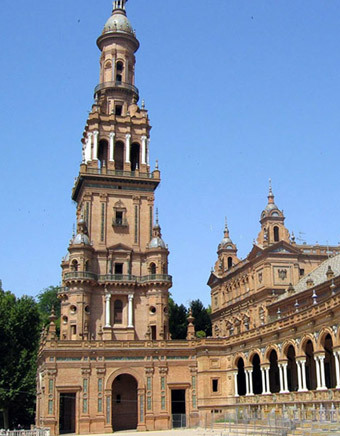 Plaza de España has also appeared in the movie Lawrence of Arabia, in a videoclip of Enigma and in many publicity spots.